RevK®'s rants: Argos: Can't tell difference between an invoice and a credit note! What is this value of 16.66% ? I thought the current VAT rate is 20%. Great if they do end up with a VAT inspection. I presume that when he went away for 15 mins and returned with a credit note, he did speak to someone higher up who obviously advised him to do this. That being the case, it sounds to me like there are more and more occurrences of higher positioned people within companies who just... do not know what they are doing. Which is highly worrying. Yes it is 20%, so I reclaim 1/6th of what was actually paid (16.66%), He definitely went off to speak to people several times and called the store support number he had. Took half an hour before I eventually gave up. I seriously doubt they will pay it, but you never know. Will be interesting to hear what they say, and what HMRC say. I am very surprised they don't provide you with a VAT receipt every time, that would be more sensible! Indeed, I will try emailing in for one. I am surprised they don't just print the required details on the order slip and be done with it. I am also surprised that they store manager and his store support people did not know that you can email to get one. If they can't tell the difference between a credit note and an invoice, they probably have no clue what an email is! In respect of: "The order ticket does not have the details of VAT rate, or amount, etc, so is not good enough to reclaim VAT." Oddly, at least according to http://www.hmrc.gov.uk/vat/managing/charging/vat-invoices.htm#6 a simplified VAT invoice does *not* have to include the VAT rate (unless it includes items that are at different VAT rates). Yeh, it says: "(e)for each rate of VAT chargeable, the gross amount payable including VAT, and the VAT rate applicable"
So even if one rate applies, it should state the rate. Had very much the same issue with PC World. You can't get one as a consumer, you have to buy through PC World for business. Which you are meant to psychically know beforehand. Anyway, as you say, it says to email for a VAT receipt. And just like your case, "Sorry, you should have asked at the store" who had said "You have to email"! So yeah. I suspect a big VAT fiddle (legal of course) that helps keep them lowest priced. I think instead of saying Argos don't know the difference between a Credit Note and an Invoice. It should be your local Argos store doesn't know the difference. 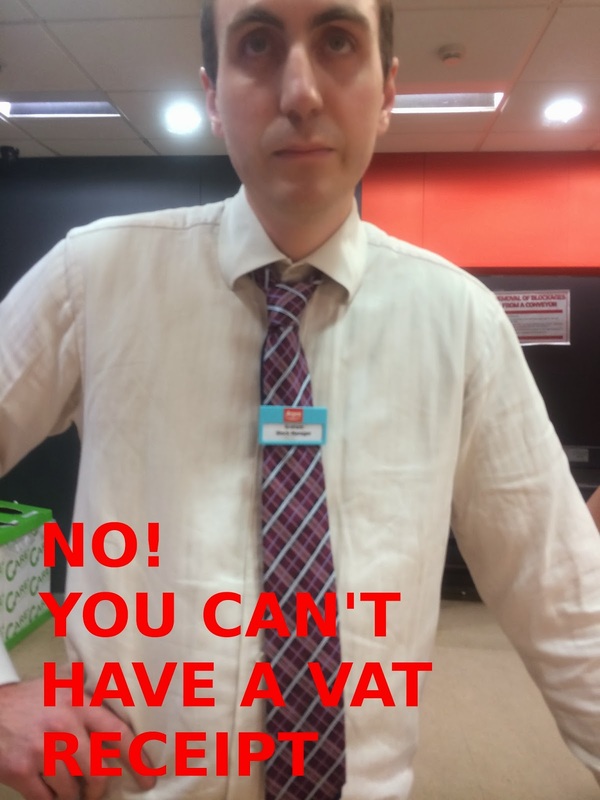 I shop between two different local Argos stores to me, I go to the customer service tills of either one, I inform them prior to making my purchases I will be requiring a VAT receipt. In next to no time I'm walking out of the store with my item(s), the normal receipt and a hand written VAT receipt with absolutely no hassle. I went to a store - asked for a VAT receipt - got told they can't print them and to go phone or go online and ask for one. Did that - got told they can't do that - and that I had to go back to the store................ where the staff were correct that they could NOT print them............. but they would hand write one!!!!! I have just purchased a laptop from Argos. Using live chat on the Argos website I have just requested a VAT receipt for the purchase. Bingo!! 2 hours later from my last comment above I have received the VAT invoice.